What’s furry, recalcitrant, and represents a medieval middle-finger? 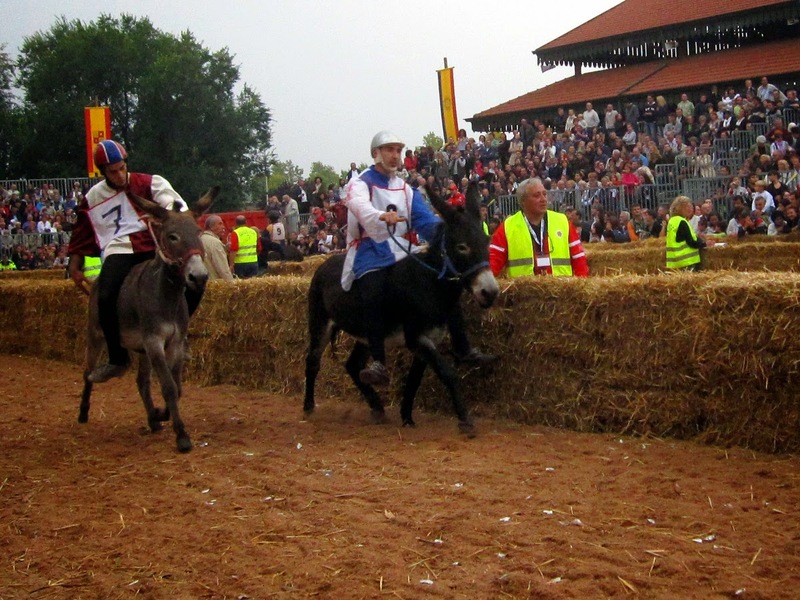 The Alba Palio degli Asini donkey race, of course! You see, in 1275, the Piedmont towns of Asti and Alba were at war. On August 10, the feast day for Alba’s patron saint San Lorenzo, Asti attacked Alba and laid waste to the fields outside the city walls. 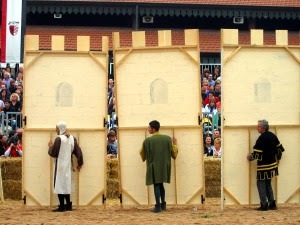 To further cement their victory and humiliate the people of Alba, Asti’s army held a horse race around the Alba city walls. 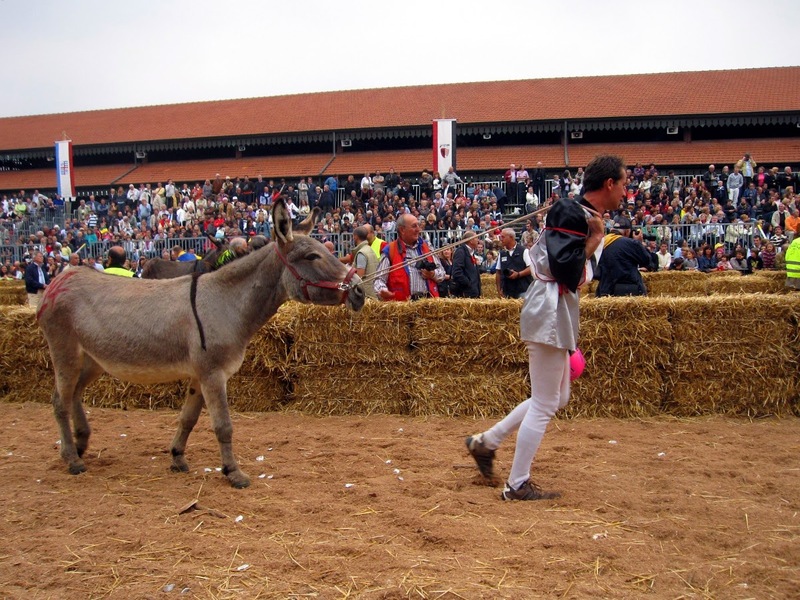 According to legend, the residents of Alba simultaneously held a donkey race inside the city walls, as a thumb to the noses of their aggressors. 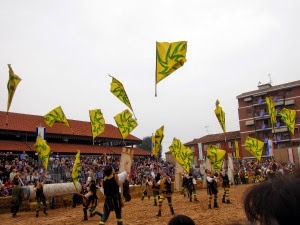 Fast forward a few centuries, and Asti began regularly running its famed palio horse race in 1929 after a few decades of hiatus. However, jockeys from Alba kept winning and tempers flared, so in 1932, Asti decided to withdraw their invitation to Alba. 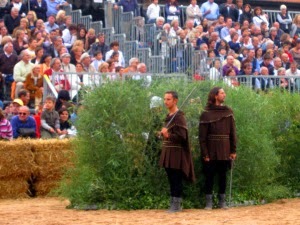 In response to the snub, Alba launched its own palio, only staged with donkeys. 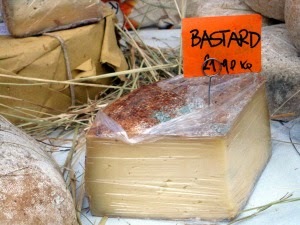 The cheeky competition parodies the prestigious Palio di Asti, and also marks the launch of the annual Alba truffle fair. The Palio degli Asini takes place on the first Sunday of October, so last weekend I hopped on a train and headed to Alba, well known for its wines, white truffles and being the headquarters of Ferrero (which produces Ferrero Rocher, Nutella and Kinder chocolates). 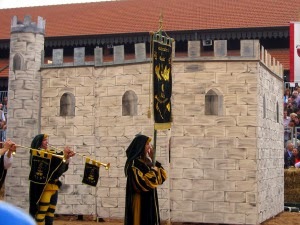 The streets of the normally staid town were thronging with visitors, as a medieval parade was winding its way to the center. In the US, I am accustomed to seeing all manner of gaudy parade floats with smiling divas giving pageant waves, but this was a much more serious affair. 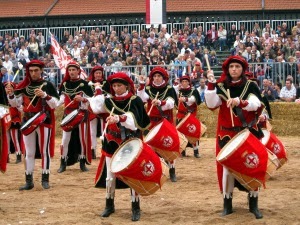 Alba’s parade is more akin to a historical reenactment, with elegant nobles and solemn snare drummers marching down a street lined with Peugeots. 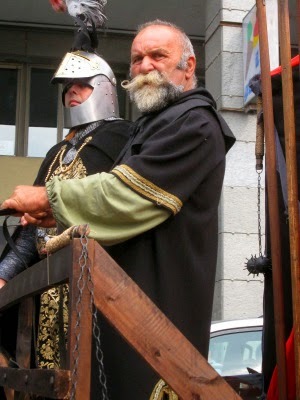 Each borgo (Alba is divided into 9 city wards) prepares a feature on medieval life, like knights pushing catapults and battering rams carved with a ram’s head, or a portrayal of the Plague of 1347, with villagers dropping like flies every few meters. Now, in case you had not realized, a donkey race is Serious Business. So serious that the mounts for each jockey are chosen by lottery, and the jockeys are amateur riders who come from all ages, genders and walks of life: students, doctors, Ferrero factory workers. There are two preliminary rounds, and the top horses from those races are selected to compete in the finale. 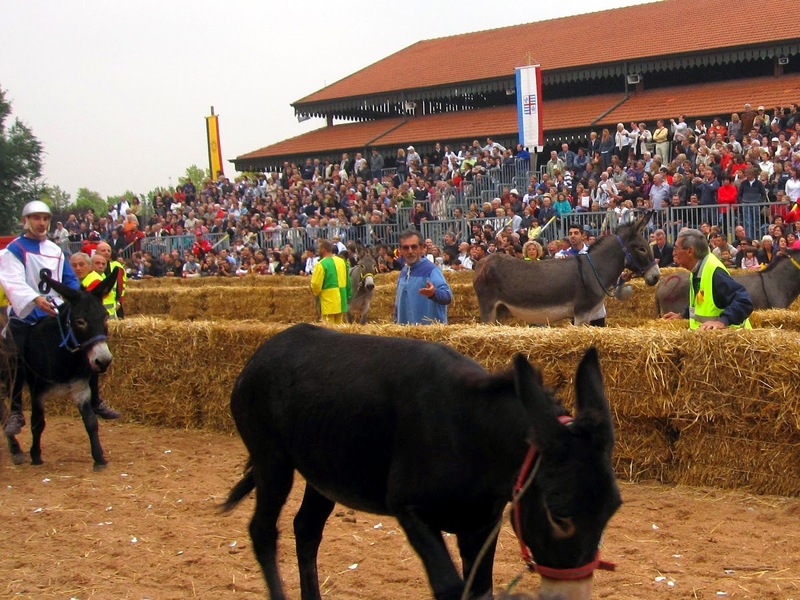 The donkeys are all numbered for clarity, and they are also given names befitting the serious nature of this race, such as Porchetta (roasted pork), Tartufo (truffle) and Sarkozy (no explanation needed). With cheers from the crowd and the ringing of a bell, the race started but it appeared that not every donkey had gotten the memo. About half of the donkeys hesitantly trotted forward, at the coaxing of their masters, a few remained contentedly still, and some perversely sauntered into a corner or backwards in the wrong direction. In this competition, the battle is not between the donkeys so much as a battle between the wills of the jockey and his less than noble though still adorable mount. The results elicited many chortles and guffaws from the audience. …while others required a little more encouragement. One donkey decided to stop running and paused to eat from the hay bales that lined the edge of the track, much to the dismay of his jockey. I would say that this is pretty embarrassing for the jockey, but then again, he is competing in a donkey race already. In the end, victory belonged to 41-year-old trader Giorgio Lenta, riding donkey #5, or Acciuga (anchovy). And he only fell off twice! Outside of the racetrack, the streets are lined with vendors hawking local specialties. Prized white truffles lay carefully protected behind humidity-controlled glass. Dried porcini mushrooms, local alpine cheeses, creamy hazelnut spreads and chestnut honeys abound, all at highly reasonable prices. 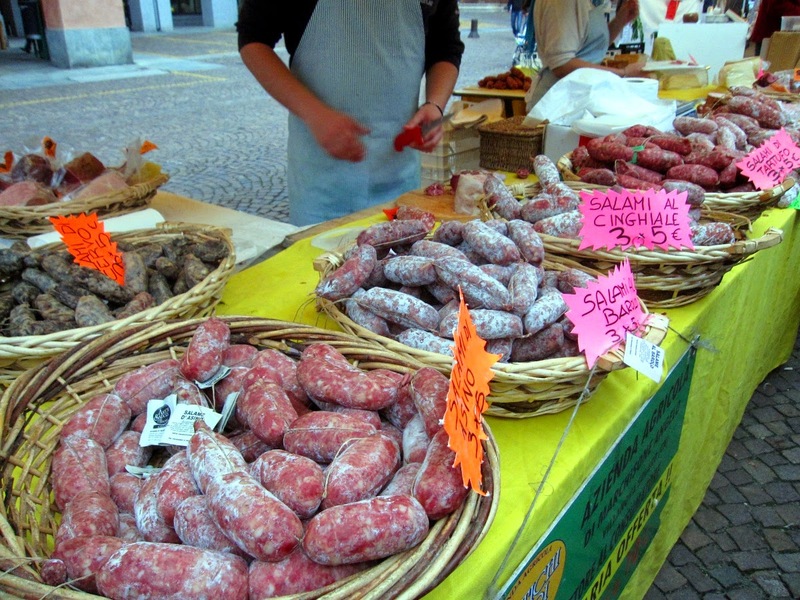 I picked up three salami for just €5, flavored with truffle, Barolo wine and cinghiale (wild boar). 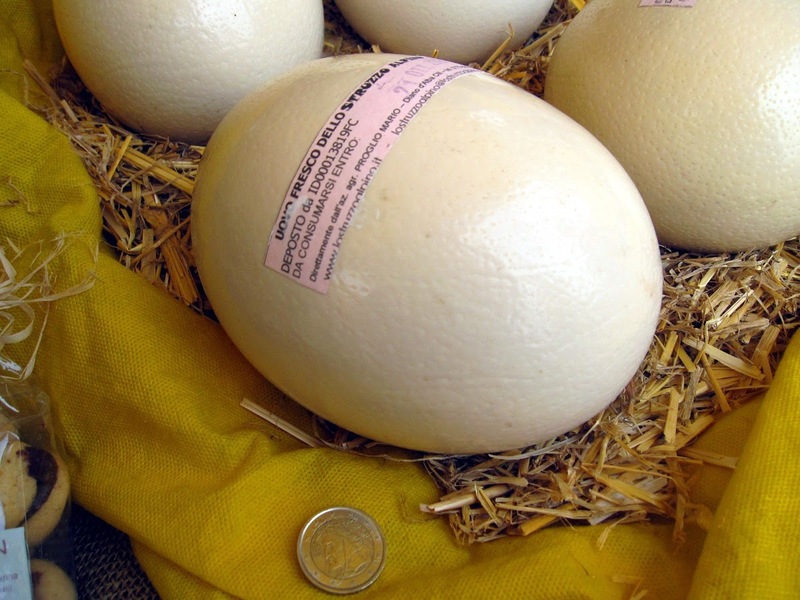 The gargantuan ostrich eggs were tempting, but I decided that at €20 this was a bit out of my budget, even if it is the volumetric equivalent of a dozen chicken eggs. You could, however, pick up the shell for decorative purposes for €10. The Fiera del Tartufo white truffle fair will continue for the rest of October, with tastings, lectures and workshop events on the weekends. Trains run regularly from Bra to Alba, and the trip costs €2 one-way.